STORM Consulting, LLC’s CEO and founder Brian Esher has written a memoir titled Rolling Coffins – Experiences of a Mechanized Infantry Soldier in the Bloodiest Year of The Vietnam War, 1968. Recounting the time spent serving with the 25th Infantry Division, 4th Battalion of the 23rd Infantry Mechanized, Brian’s raw and gripping tale of courage and finding balance amongst a time of pure chaos is truly remarkable. As an infantryman during the Vietnam War, Rolling Coffins chronicles the first-hand experience of serving on the front line during what is considered one of the worst years for wartime casualties. Immersed in a foreign land, miles removed from loved ones and surrounded by life or death perils, Rolling Coffins is a personal tale of navigating the daily chaos of wartime unrest. 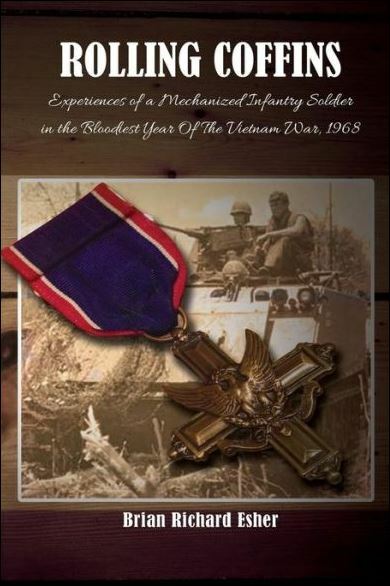 From the challenges of government shortcomings, personal sacrifice, loss of fellow comrades and living in constant fear and uncertainty, this memoir paints a vivid portrait of the horrors of war and the events that led up to Brian receiving numerous honors, including the second-highest military award for valor, the Distinguished Service Cross. To learn more or get a copy of Brian’s book – Rolling Coffins can be found on Amazon and Barnes & Noble.